For UUSG needle artists, May is send-off month! After our monthly gathering between services on Sunday, May 1, we'll send our knitters, crocheters, and quilters off to work on their own over the summer. And at the end of May, we'll collect all the completed projects we can for sending off to the organization Women4Women Knitting4Peace, whose incredible folks will hand-deliver the much-needed, comforting items to women and children in global areas of conflict (including locations in the U.S.). Please join us in making scarves, shawls, baby blankets and bibs, toys, sleeping mats, and other items. Yarn, patterns, needles, and assistance are available on request. For assistance, instruction, and/or encouragement, please contact Jamie Carroll at knitting@uusg.org. 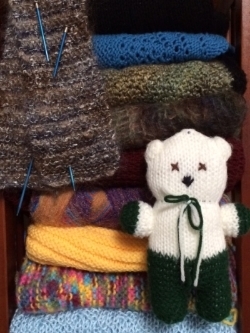 Our Commit to Knit group creates warm knitted (and crocheted) items for a number of causes. In March 2015, the group sent two boxes of scarves, blankets, shawls, and other items to the organization Women4Women Knitting4Peace. Women4Women Knitting4Peace continues to request winter items, toys, and quilted sleeping mats. Check out the patterns section of the non-profit’s website: knitting4peace.org/what-wedo/patterns. In addition to the donations for Women4Women Knitting4Peace, we also create items for local recipients as requests come in to the church. For example, in December 2014 we delivered 4 shawls and 4 lap robes to the Geneva Care Center for a residents' holiday party. The group currently has approximately 30 members, each with unique skills and abilities. Most folks work on their own at home, although for those who are interested we schedule a regular gathering between UUSG services on the first Sunday of each month. We're always delighted to welcome new crafters and to receive donations of yarn, needles, hooks, and patterns. All skill levels are welcome! Supplies are available to help you get started. Beginners, you are invited to request individual attention. Current projects will also be donated to Women4Women Knitting4Peace. If you’re interested in this group, please send an email to Jamie Carroll and/or join us in the Common Room between services on the first Sunday of each month.